The ductility test can also determine Embrittlement in certain components. Embrittlement is a complete loss or partial loss of ductility in material where an embrittled product characteristically fails by fracture without appreciable deformation. The most common Embrittlement is usually encountered in galvanized steel related to aging phenomena, cold working, and absorption of hydrogen. Embrittlement or loss of ductility in steel is often associated with strain-ageing. Strain-ageing refers to the delayed increase in hardness and strength, and loss of ductility and impact resistance which occur in susceptible steels as a result of the strains induced by cold working. The aging changes proceed slowly at room temperature, but proceed at an accelerated rate as the aging temperature is raised and may occur rapidly at the galvanizing temperature of approximately 455°C (850°F). Hydrogen Embrittlement may also occur due to the possibility of atomic hydrogen being absorbed by the steel. The susceptibility to hydrogen Embrittlement is influenced by the type of steel, its previous heat treatment, and degree of previous cold work. In the case of galvanized steel, the acid pickling reaction prior to galvanizing presents a potential source of hydrogen. However, the heat of the galvanizing bath partially expels hydrogen that may have been absorbed. In practice hydrogen Embrittlement of galvanized steel is usually of concern only if the steel exceeds approximately 1100 MPa (150 ksi) in ultimate tensile strength, or if it has been severely cold worked prior to pickling. 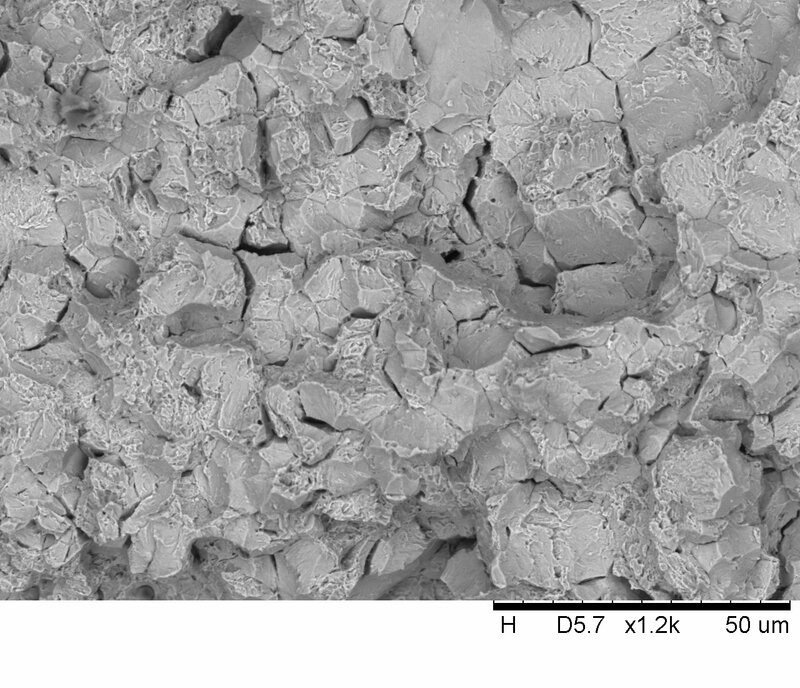 Following micrograph reveal hydrogen embrittlement detected by one of LMATS Engineers. Loss of ductility of cold-worked steels is dependent on many factors including the type of steel (strength level, aging characteristics), thickness of steel, and degree of cold work, and is accentuated by areas of stress concentration such as caused by notches, holes, fillets of small radii, sharp bends, etc. LMATS Laboratories in Melbourne,Sydney, Brisbane and Perth can assist manufacturers and galvanisers by performing tests in accordance with ASTM A143, AS 4671, AS 4680, EXXON Mobil, ESSO Shell specification and similar national and international standards. Contact one of the LMATS laboratories near your lcoation.